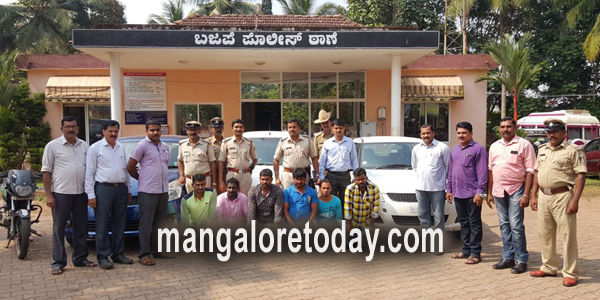 Bantwal, Nov 05, 2016 : Police team led by PSI Satish on instructions from Bajpe police inspector Nagaraj have been successful in arresting six cattle traffickers at Polali in Bnagtwal 0n November 05, Friday. They mow down police and had fled from scene. The accused have been identified as Nawaz alias Abdul Nawaz of Shantinagar, Kavoor, Mohammed Mansoor alias Manchu, a resident of KC Road, Kotekar, Imran (28) of Maripalla, Imitiaz (32), Bhatish (30), a resident of Adyar and Asgar alias Abbas (30) of Kotekar. The police have seized three cars (two Swifts and a Ritz), mobile phones, cash, machete and other sharp tools from them. Bajpe and Beltangady police have registered the case under relevant sections of the IPC and the Arms Act. Investigations are underway.